Prince William is among celebrities lending support to a campaign launched by the charity Child Bereavement UK, which asks children who have lost a parent, or parents who have lost children, what they would say to their loved one if they had another minute with them. TV cook Mary Berry, actor Jason Watkins and former footballer Rio Ferdinand, whose wife, Rebecca, died in 2015, also feature. 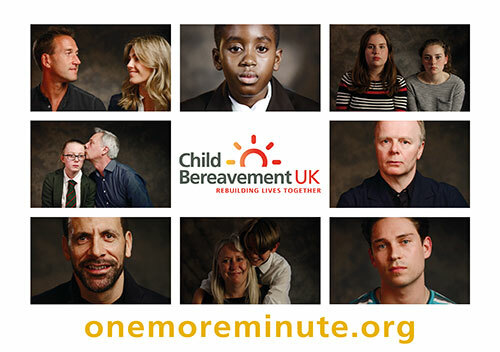 The campaign aims to raise awareness of the needs of bereaved children and families and the benefits of support. The charity’s chief executive, Ann Chalmers, said the idea was to help people understand the impact of bereavement: “The film touches on the longing that many bereaved families tell us they have, to be able to have more time with the person who has died,” she said. The charity believes it is very important for children to be told the same information and truth as the adults around them and not doing so could do them harm for the rest of their lives,” she said. Around 110 children lose a parent every day, and more than 10,000 children and young people aged under 25 die each year. Around one in nine schoolchildren dealing with a bereavement. A poll for the charity found that one in five British adults grieving for a family member wished they had more support.